THE COMPANY BEHIND GoPro cameras used to capture sports action from players’ perspectives filed on Monday to raise $100 million in a public stock offering. Silicon Valley-based GoPro didn’t disclose how it planned to price shares, but it did reveal that it is already profitable, making a net income of $60.6 million (€44 million) on nearly a billion dollars in revenue last year. GoPro said in a filing with the US Securities and Exchange Commission that profit slowed to $11 million on $235.7 million (€172 million) in revenue in the first three quarters of this year. “GoPro is transforming the way consumers capture, manage, share and enjoy meaningful life experiences,” the company said in the SEC filing. 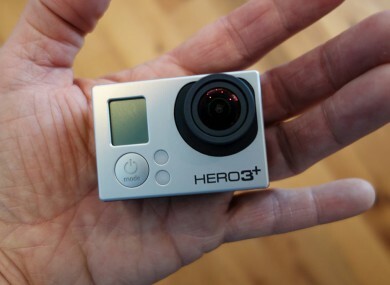 GoPro cameras have become common among people involved in extreme sports and routine athletic outings, and have even been used by emergency or disaster workers. The company said in the filing that video shared by users has resulted in “virally” driving awareness of and demand for the small cameras. “What began as an idea to help athletes document themselves engaged in their sport has become a widely adopted solution for people to document themselves engaged in their interests, whatever they may be,” GoPro said in the filing. The company that started as Woodman Labs became GoPro in 2004, and has its headquarters in the Northern California city of San Mateo. GoPro did not specify how it planned to use money raised in the initial public offering of stock other than to say it will be used to run the company and repay debt. GoPro cameras are sold in more than 100 countries. They were the top selling camcorder in the United States last year, according to NPD Group figures cited in the filing. Email “GoPro plans to raise $100 million by filing for IPO”. Feedback on “GoPro plans to raise $100 million by filing for IPO”.